Armed with new tools, patients and parents felt empowered to remind healthcare providers to perform hand hygiene, successfully improving compliance rates, but just over half of physicians felt that patients should be reminding providers, according to a new study published in the August issue of the American Journal of Infection Control, the official journal of the Association for Professionals in Infection Control and Epidemiology (APIC). Healthcare-associated infections (HAIs) contribute to significant rates of illness and mortality, with an estimated five to ten percent of patients admitted to acute care hospitals in the United States acquiring an HAI. Most HAIs are preventable, and the single most effective measure to reduce HAIs is hand hygiene. 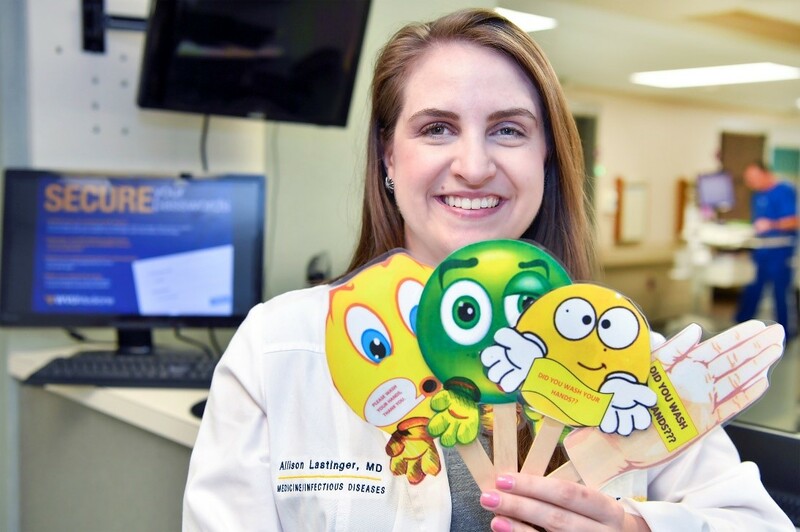 Allison Lastinger, MD, of the West Virginia University (WVU) School of Medicine, led a multidisciplinary research team that performed a cross-sectional survey of parents of hospitalized children, adult patients, and primary care physicians at the WVU Medicine J.W. Ruby Memorial Hospital, a 645-bed tertiary care teaching hospital in Morgantown, WV. Using an anonymous, self-administered questionnaire, the multidisciplinary research team—which included Kayeromi Gomez, PhD, of the WVU School of Public Health, Ellen Manegold, BA, of the WVU Department of Psychology, and Rashida Khakoo, MD, of the WVU School of Medicine—examined their attitudes toward a new patient empowerment tool (PET) at the hospital. The parent and patient surveys were distributed from December 2015 to June 2016; the physician survey was distributed in November 2015. Among 89 healthcare provider responses (29 residents and 60 attending physicians), only 54.9 percent felt that patients should be involved in reminding providers to perform hand hygiene. Overall, physicians indicated that they would prefer a patient make the request verbally, rather than using the PET to remind them to perform hand hygiene. Of the physicians who did not support patient involvement, 37 percent felt that it was not the patient’s responsibility to remind physicians to perform hand hygiene; 16 percent felt that it was embarrassing to the doctor; and 13 percent felt that it would have a negative impact on the patient-physician relationship. While a number of studies have examined the role of patient involvement in healthcare worker hand hygiene, few have examined the role of family members in reminding healthcare providers to perform hand hygiene. However, the study notes that if patient involvement is to be successful, healthcare workers must accept it as helpful and not as a threat, which proved to be somewhat of an obstacle in this instance. Visit www.apic.org for more resources on proper hand hygiene. The article is “Use of patient empowerment tool for hand hygiene,” by Allison Lastinger, Kayeromi Gomez, Ellen Manegold, and Rashida Khakoo (http://dx.doi.org/10.1016/j.ajic.2017.02.010). It appears in the American Journal of Infection Control, Volume 45, Issue 8 (August 2017) published by Elsevier. AJIC covers key topics and issues in infection control and epidemiology. Infection preventionists, including physicians, nurses, and epidemiologists, rely on AJIC for peer-reviewed articles covering clinical topics as well as original research. As the official publication of APIC,AJIC is the foremost resource on infection control, epidemiology, infectious diseases, quality management, occupational health, and disease prevention. AJIC also publishes infection control guidelines from APIC and the CDC. Published by Elsevier, AJIC is included in MEDLINE and CINAHL. APIC’s mission is to create a safer world through prevention of infection. The association’s more than 15,000 members direct infection prevention programs that save lives and improve the bottom line for hospitals and other healthcare facilities. APIC advances its mission through patient safety, implementation science, competencies and certification, advocacy, and data standardization. Visit APIC online atwww.apic.org. Follow APIC on Twitter: www.twitter.com/apicand Facebook: www.facebook.com/APICInfectionPreventionandYou. For information on what patients and families can do, visit APIC’s Infection Prevention and You website at www.apic.org/infectionpreventionandyou.